DYNAMIC CHORD feat. 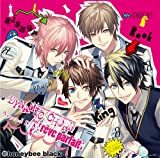 [rêve parfait] Append Disc DYNAMIC CHORD feat.Liar-S DYNAMIC CHORD feat.KYOHSO DYNAMIC CHORD feat.apple-polisher DYNAMIC CHORD JAM＆JOIN!!!! DYNAMIC CHORD JAM＆JOIN!!! !